Alpacas, together with the guanacos and vicuñas, are ruminants belonging to the Camelidae family, sub-order Tylopod, order Artiodactyla. This classification includes Asian and Arabian camels and dromedaries, which are not very distant relatives of the South America camel family. The separation begins at the level of the bribes Lamini and Camelino, with the genera Lama and Camelus. From the prairies of North America, two migratory currents were to depart. Some went north, reaching Asia by way of the Bering Strait, and their descendants are the camels and dromedaries. The other group migrated southwards occupied the Central Andes, and after dispersing over the Argentine pampa reached Tierra del Fuego in the extreme south of the continent. The processes of evolution of the two genera were quite different. Anatomical, physiological and behavioral changes have enabled the Camelus to subsist in arid regions where it is subjected to long periods without water. The Lama, on the other hand, has adapted to dry lands at high altitudes, where it has learned to withstand the lack of oxygen and the tough pastures with their high fibre content. Note: May 1775 J.L. 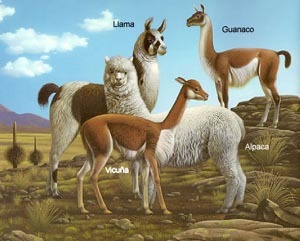 Frisch created the genus Lama for all the South American species. In 1924, C. S. Miller proposed the genus Vicugna for the vicuña. Some taxonomists disagree with this denomination since it refers to a single species…they all process the same karyotype – demonstrating the close genetic link between them. Llama: (Lama glama) Domesticated species. The earliest mention of llamas dates from the 1511. The llama is found throughout the regions that previously formed part of the Inca Empire, for the Indians took them with them during the Inca expansion, using them to transport provisions and other items. Llama is the name of the animal in the Quechua language – it is the most cosmopolitan of the five species, since it lives at various latitudes and altitudes, from Chile to Colombia, from the coast of Peru to 16,400 feet above sea level. The llama is a tough animal that can graze on any type of land, including dry pastures, and can go for several days without eating; although it does not store water like the camel, it can easily withstand thirst. It is docile, quiet and very inquisitive. They recognize their masters and their habitual living quarters. The herdsman’s favorite llama, which carries his personal belongings and is the one he takes to market, is known as sak’ati. The llama is used as a beast of burden and as a source of meat only in South America! Its wool is also employed in the manufacture of bags, ropes and other articles that need to be particularly strong. Llamas move slowly but surely; no path is too difficult or rugged for them, and their hooves do no damage to the ground. This is why they are used as pack animals in areas governed by environmental protection laws, such as the nature parks in the United States, where horses, mules and donkeys are prohibited because of their hard hooves erode the ground. Llamas can live for up to thirty years, although their useful live is 15-20 years. Guanacos: (Lama guanicoe) Wild species. The guanaco is the species with the greatest capacity for adapting to it surroundings. There are guanacos living at sea level, and others in the high Andes at altitudes of over 15,000 feet. Their body hair is reddish; with a slight gingery tone…this characteristic colouring has given rise to the descriptive term “guanaco colour” used in specialist literature. Comparison with the llama shows the guanaco to have a more rounded back, silkier hair – though not of the quality of the vicuña – and smaller feet. Alpacas: (Lama pacos) Domesticated species. The name “alpaca” has become synonymous with fine, high-quality wool used in the elegant world of haute couture – and not without good reason, for the wool has also been shown to be one of the warmest as well as the finest, only surpassed by the vicuña and perhaps certain species of goat. They are smaller and delicate in comparison to the other lama species. The alpaca is not bred for its meat but for the wool production. Alpacas like to feed on fresh pastures and are accustomed to grazing in damp areas and to eating various different foods during the day. Herdsmen say that their breakfast, lunch and dinner each consist of different plants, and they also have their own equivalent of the “hot pepper”. Vicuñas: (Vicugna vicugna) Wild species. The vicuña is the smallest of the camelids and has the finest wool. There was a time when it was in danger of extinction, and it was therefore included in the list of threatened species. For Peru, the vicuña represents its natural wealth of fauna and has therefore been included in the national coat-of-arms. The Inca rulers only wore costumes woven from vicuña wool. They used them once only, and then donated them as handsome and much valued gifts. The vicuña is very shy animal and is therefore difficult to domesticate. The vicuña is a fragile-looking, graceful and extremely agile animal. Camels: Domesticated species. This is another speech – we also raised camels and had 10 offspring before we fazed them out – the gestation is 14 months and they were not as sweet tempered as their cousin the llamas. Our pair was named Clyde and Claudia.